“It definitely was the best trip I’ve ever experienced,” said Tarik Raed, a junior business administration major and one of this year’s participants. The trip is part of the Carnegie Mellon Initiating Meaningful Pittsburgh and Qatar Ties (IMPAQT) program, sponsored by the Qatar Foundation and the Division of Student Affairs at Carnegie Mellon in Pittsburgh. The Qatar Foundation is a privately chartered nonprofit organization founded in Qatar in 1995 by Emir Sheikh Hamad bin Khalifa Al Thani. The foundation funds education, science, and community development initiatives, and was the enabling force behind the formation of Education City, the collection of Qatar campuses of which Carnegie Mellon is a part. Founded in fall 2008, the IMPAQT program sends eight students to the campus each spring break to strengthen Pittsburgh’s relationship with the Qatar community. Throughout the trip, the students learn all they can and bring it back to Pittsburgh in the form of cross-campus collaboration projects. To learn about the culture of Qatar, the students were encouraged to completely immerse themselves within the local community. Bahati Mutisya, a junior business major and one of this year’s participants, is a dancing enthusiast and especially enjoyed the dance lessons, which included bhangra, belly dancing, and dabke dancing. She also took a lot from the sessions held. In terms of their most memorable moments in Qatar, Raed, Mutisya, and Akyar all agreed that this was in their time spent with the Qatar students. While in Doha, the students were also able to explore the city outside of the campus. 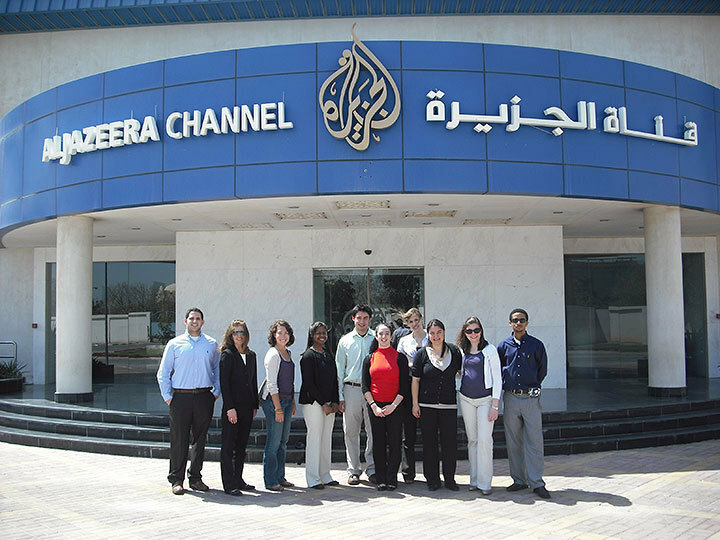 “We had the opportunity to do some fun activities off campus such as sand-duning, or ‘sand-bashing’ as the students in Qatar call it; tour Al-Jazeera; walk around in the souk; visit Fanar, which is the Islamic Cultural Center; tour the ASPIRE sports complex; and visit the Islamic art museum,” Akyar said. The last night of the program, the students spent the night with families of the Qatar students. The women in the group experienced a home stay while the men spent a night out in the desert. The students were able to interact with 14 Qatar students who visited the Pittsburgh campus the week before spring break to experience American culture and interact with the students in a similar way to the IMPAQT program, and the groups were able to share their experiences. Past participants are in constant collaboration, as they all work on forming their own projects that help unite the campuses. Last year’s projects included an orientation event at The Frame to show incoming Pittsburgh students part of the culture of Qatar, a photo installation in Morewood showing images of Carnegie Mellon’s Qatar campus, and a seminar and lunch discussion for Ph.D. students considering research in Qatar. Students participating in IMPAQT consistently mention the lessons they learned from traveling to Qatar, as well as creating projects with their fellow students. “I could not have learned what I learned in a classroom or from a book. It was an eye-opening experience,” Mutisya said. Applications for the 2011 IMPAQT program will be available in the fall.